It’s been three months since we moved into this new house. It feels like home now. We cherish the crisp air in the mornings, the evening breeze, and I must sheepishly admit, I sometimes miss the sounds and cacophony of Marathahalli. 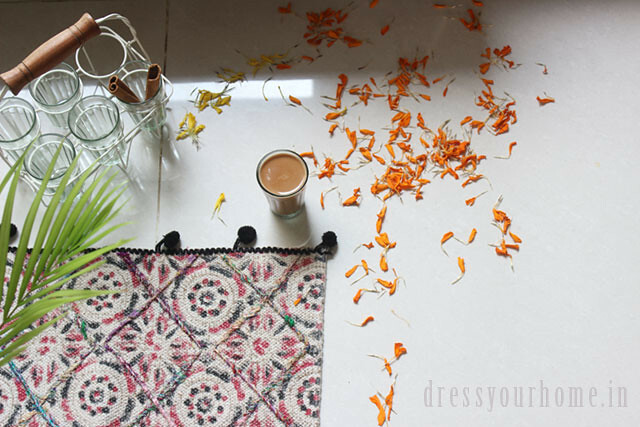 In today’s post, I offer you first glimpses into my kitchen: a place that I hold dear to my heart because of the time and effort that went into its planning, civil modifications, designing, choosing a vendor and execution. It is a 14 feet long by 11.5 feet wide east facing kitchen. The kitchen is flanked on north side by the living room wall and on the south by the utility. It is open on the east and faces the main road on the west. There is a huge 4 * 3 window on the west side. Originally, the kitchen was smaller as it had a servant room with an entrance from the outside. I knocked off the wall for the maid room and extended the kitchen. That was a no-brainer. The hob had to face west so that the person cooking faces east. 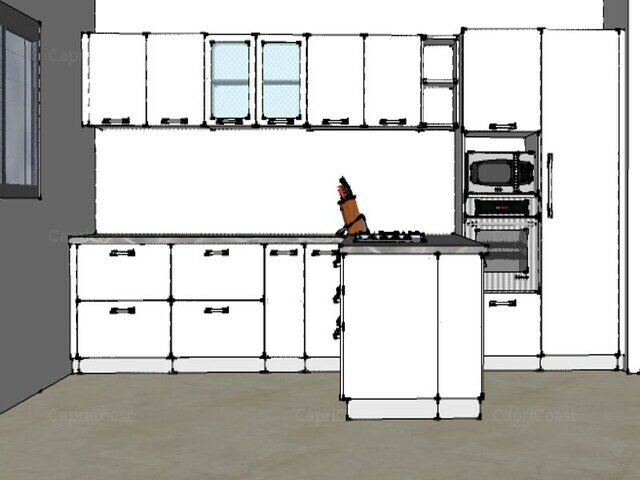 With the given layout, unless it was a island kitchen this wasn’t possible. 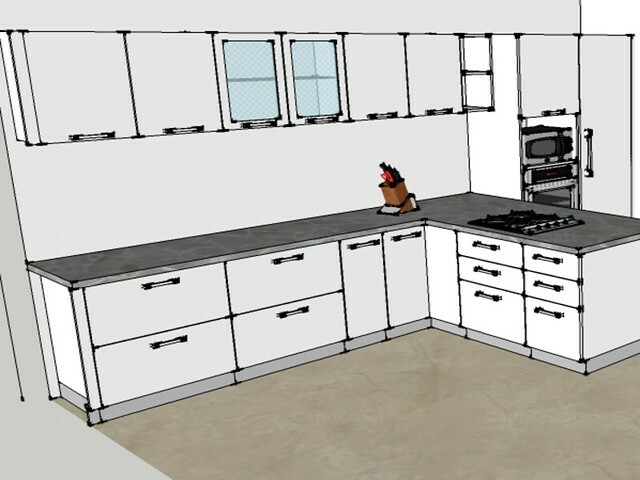 But, there was not enough space to have counters on either side and an island. It took months to design the kitchen. One evening last April, I got in touch with Anjan of CapriCoast. He was patient enough to incorporate all my requirements and worked on three possible designs. After several iterations, there was something missing either in terms of space or placement of cabinets. 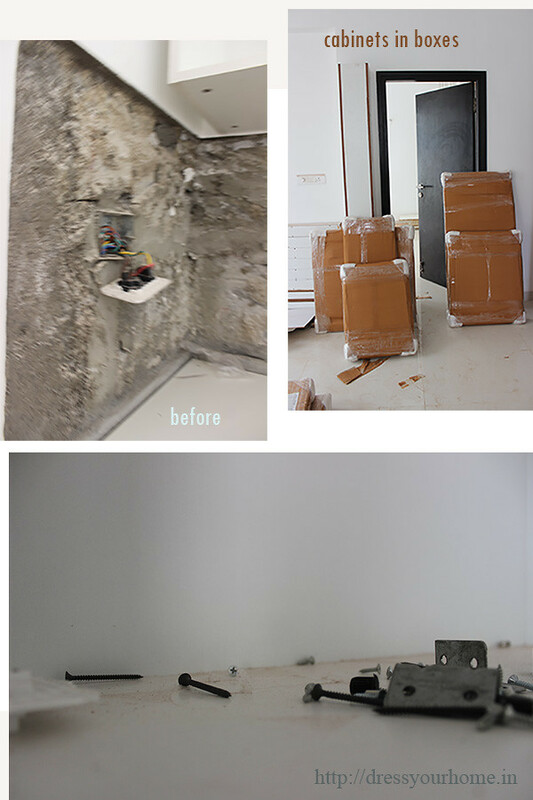 We were pressed for time as electrical and plumbing work had to be wrapped with the builder, and had to finalize the design soon. Simultaneously, as Anjan worked, one evening, my son and I sat down with pieces of paper and ruler and finally cracked it – a design I truly believed would work. 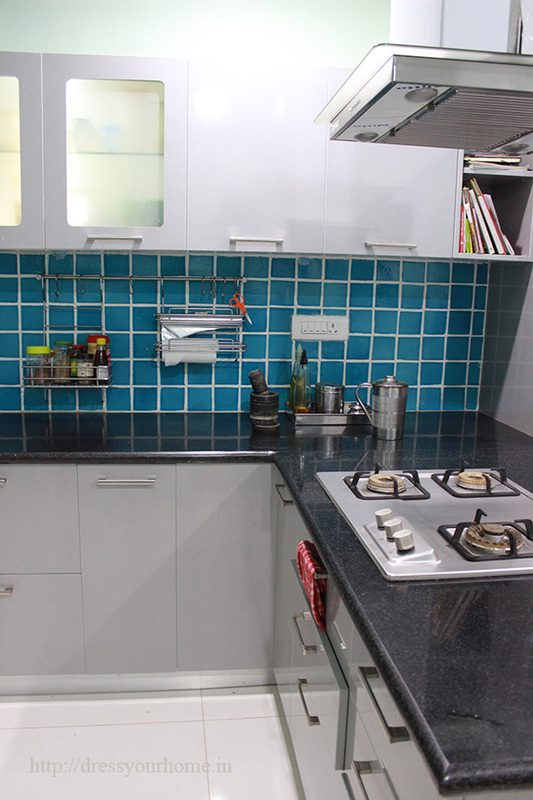 No one was convinced with the design as they felt the hob in the center takes away the beauty of a large kitchen. I went with my conviction on this one, and I can safely say now the broad counter space works wonders. View from the window facing the living room. The dry and wet areas are totally isolated. When you have plumbing or seepage issues, your cabinets are protected. There have been cases of flooding in a couple of houses. The provision for grinder is just by the side of the dishwasher. So I take it out, use it and keep it back underneath along the wet area. The broad counter space by the hob allows two people to cook simultaneously. The kitchen triangle is maintained with the fridge-hob-sink. Pantry is near the kitchen opening that I use to stock extra groceries and snacks. Works well for the family to access. Enough light because of two large windows on the west and south. The sink in the utility is just behind the sink in the kitchen. Remember the blue tiles I always wanted? After months of tirelessly searching, I found one vendor in Noida that fit my budget. These porcelain tiles took three weeks to fire and another two weeks to be shipped. I was very happy with Anjan (then designer at CapriCoast) and Nagesh (who came to the site to take measurements for the design). The design was free of cost. I wanted to sign up CapriCoast for the entire house, but they were offering only kitchen solutions. 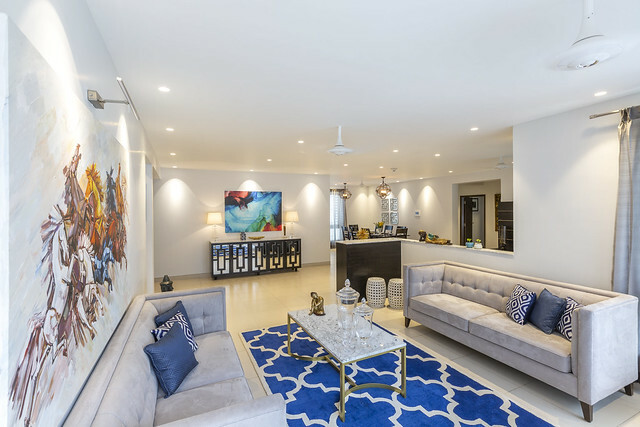 Overwhelmed by dealing with two parties, I put CapriCoast on hold and in June, hired an independent interior designer who was working on other villas here. Some things are just meant to happen. In September, someone from CapriCoast got in touch. By then, things were not going too well with my interior designer. I took about 2-3 days to decide and as I said, some things are just meant to happen. 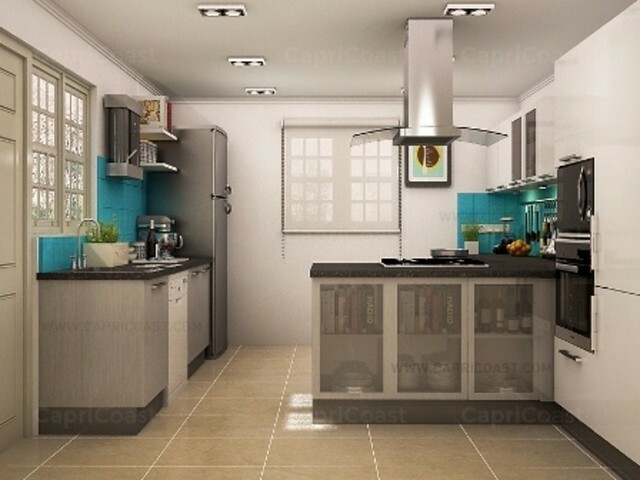 I canceled the kitchen with my interior designer and handed over the kitchen to CapriCoast. A decision I’m thankful for even though we went through a harrowing ordeal with the other person – another story for another day with lots of lessons. The installation began in November end and was handed over to us by mid January. 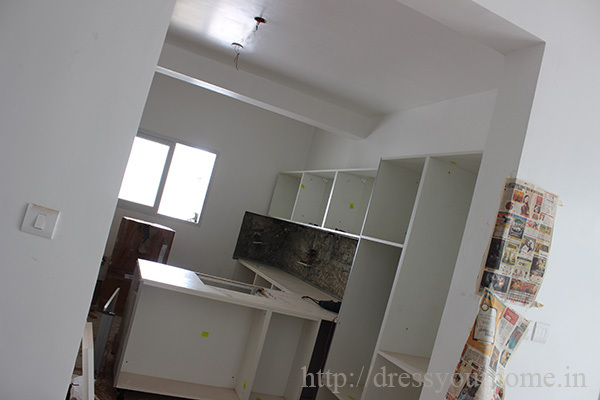 Most of the kitchen was complete by mid-December except a few accessories and fine-tuning of the cabinet hinges. 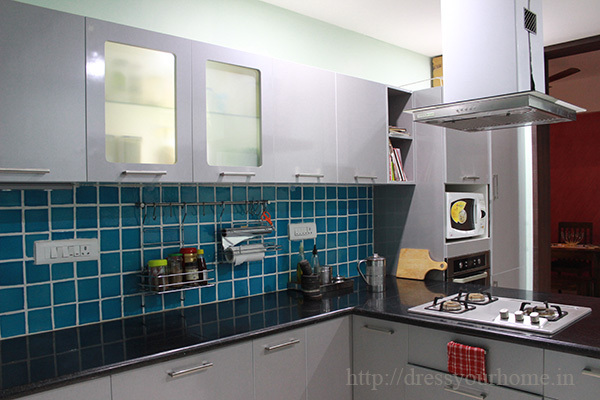 Hi-gloss silver grey color cabinets. Blum tandem boxes. I did not want any stainless steel baskets except the thali rack. 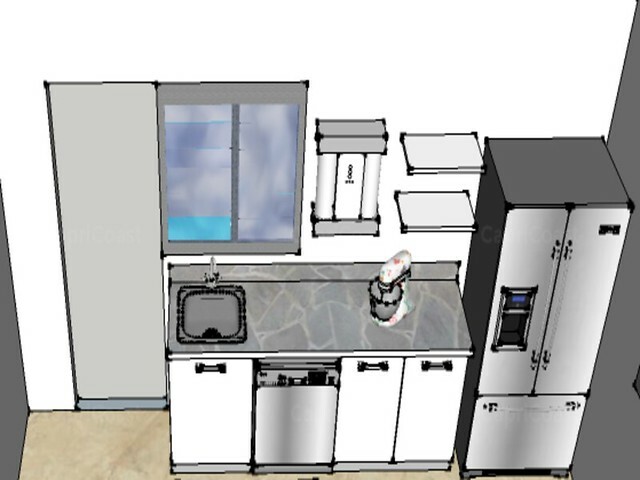 Cost of the kitchen: ~ Rs.4,00,000 including civil work. 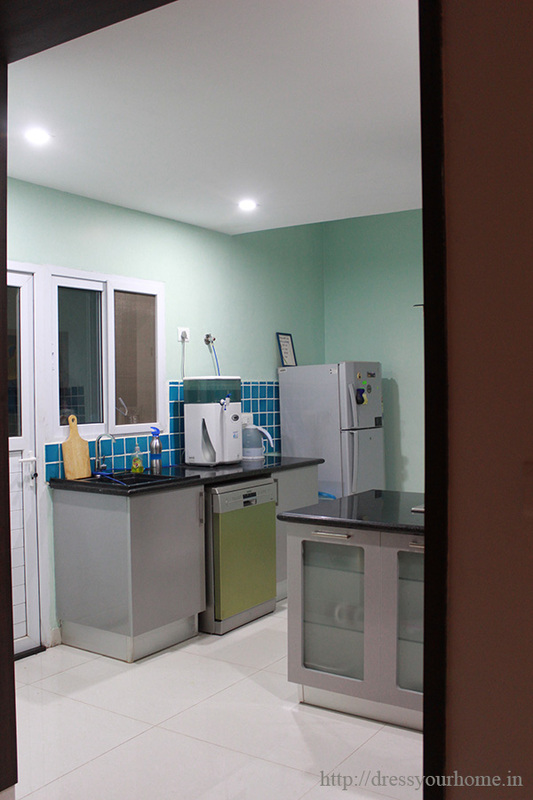 Cost of the kitchen was ~Rs.3,00,000 with the remaining towards tiles, civil work, granite slab, and two sinks. What it does not include: appliances. I have a Faber built-in oven, Faber microdecor brass burner hob, Faber island chimney and a Siemens dishwasher. Ready to take a walk through? 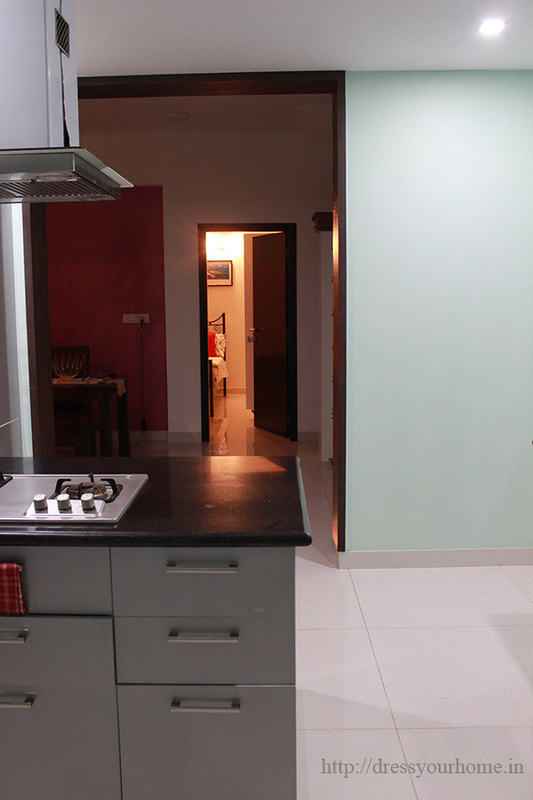 Now, over to the finished, lived-in kitchen. Happy memories are being made everyday. Falling in love with cooking for the family again. Making space for a healthier living. Very few plastics remain in my kitchen. All spice jars replaced with glass bottles. 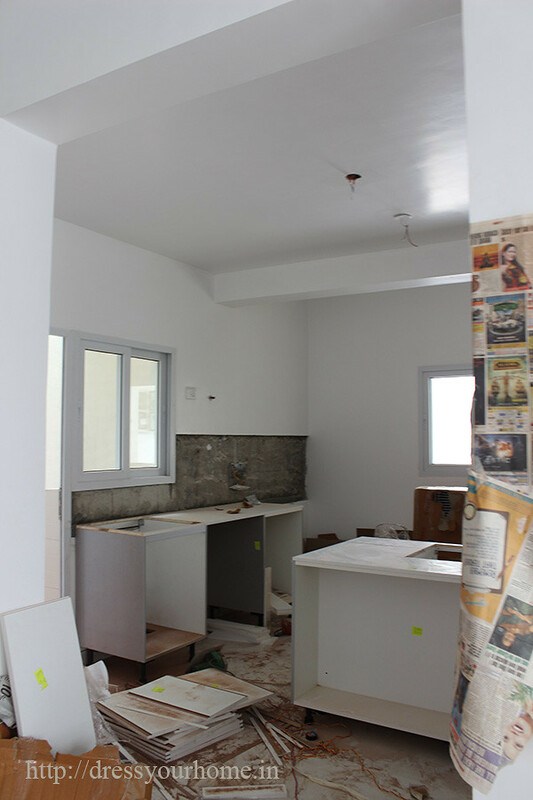 I cannot express the happiness when I first saw the cabinets being installed. 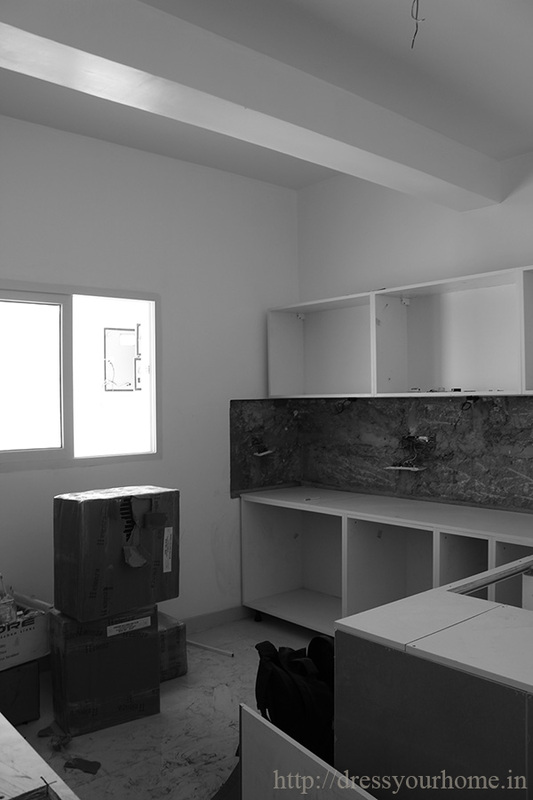 The kitchen looked much more beautiful before the granite was installed. Yes, I was deliberating going with an all white cabinet color but Anjan discouraged saying there has to be balance between aesthetics and practicality. Wise thought I would say. Building a house is hard work: physically, financially, and emotionally. Thanks to CapriCoast for making a part of it easier on us. Was not very happy with the civil work team but I understand they have a new team in place now. The CapriCoast supervisor on site Nagesh is one of the most committed professionals I have seen till date. He is an asset for CapriCoast. Whenever he was on site supervising which was almost always, rarely did something go wrong. The two days he was on leave, the team messed up laying blue tiles. For the second part of the design, Shwetha was the designer and it was a pleasure to work with both Anjan/Shwetha. Their attention to detail in terms of mm, and what should go where, is what made the difference. 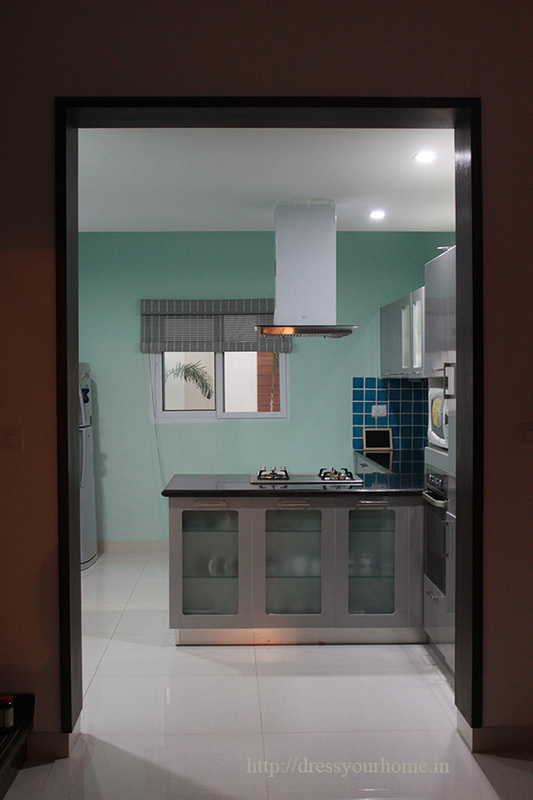 Their guidance in choosing under cabinet and inside the cabinet lights. This was bit of a trial and error for me. 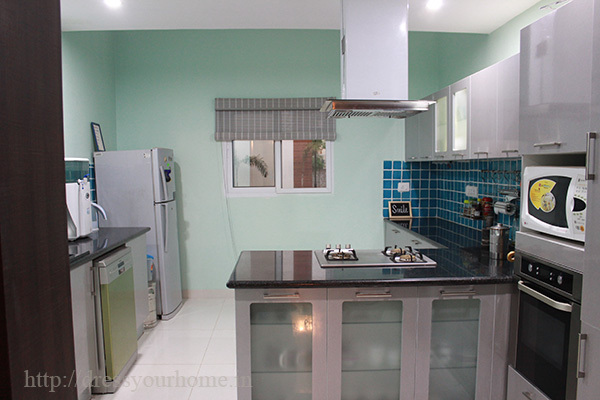 Just in case you are wondering if this was a free kitchen or sponsored post, no :( It is not. I just believe spreading the good word when someone does an awesome job makes the world a happier place. Let me know if you would like to know more about a specific part in the comments below and I will be happy to answer. Do let me know if you would like to know what other vendors we worked with during the course of making this house. I know if there was a resource list, it would have been helpful for us. I was wondering where your chimeny outlet tube is kept. That part is not clear from the pictures. Can you help with that? The front part you see is actually a false ceiling. It is underneath it and goes out into the utility. 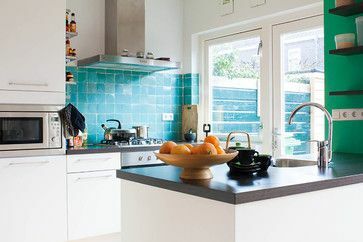 Wow…..love..love the blue tiles…….they go very well with your silver cabinets ??? Yes Vandana. I wanted partially qhite cabinets but I’m glad went with grey. Very easy to manage. Amrita: these are custom made. Based on the city you live in, you can look around and ask for custom made tiles. 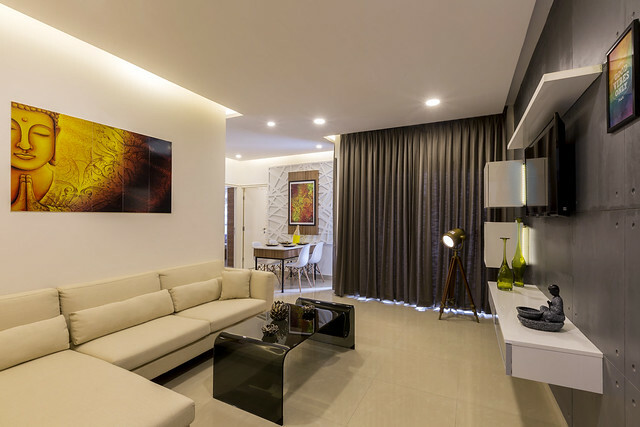 In Bangalore, you can check at Celestile, Chabria, and Vishnu Marketing in Indira Nagar, and Ceramique. No, the builder had not fixed tiles. We asked for the dado area to be left blank. Tiles were fixed after the cabinets. Yes, you should be able to, but it will be a lot of work. Can you do a review of the Siemens dishwasher now that you’ve been using it for sometime?? ?…..does it do a good job with the Indian cooking utensils?….also, how about the cost of maintenance ?…is it really worth the investment??? Where did u get the Siemens dishwasher ??? I’ve scouted more than a dozen leading e-shops in Bangalore…..none of them seem to have it :( did u purchase it online ??? From their Indira Nagar store. Actually, it’s a pain buying the kitchen appliances..none of the stores house all the brands. Faber doesn’t work on Sunday. Kaff had no outlets when we were looking. Elica in Marathahalli had a lousy sales team that was more interested in seeing cricket matches. That kind of prompted me to go next door to the Faber showroom and pick up all three devices – oven, hob and chimney. I totally agree with you…..thanks for the info….